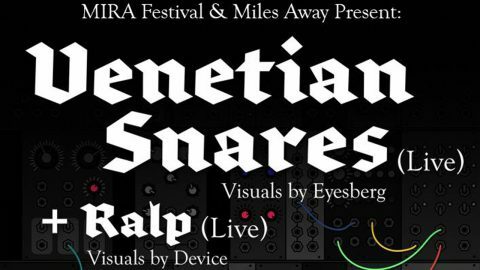 MIRA – Live Visual Arts Festival and Miles Away present Venetian Snares tour. MIRA Festival will curate the opening concert by Ralp and the visual show of the Canadian artist who will perform on April 13th in Barcelona (Sala Razzmatazz II) and 14th April in Madrid (Chango). The visuals of Venetian Snares will run on Eyesberg. The Barcelona’s creative lab hasdesigned a 3D visual show (that has to be watched with special glasses), generated in real time and synchronized with music -mixing generative art and video micro loop-. A show that explores all possibilities of circular and spherical geometry, a show that will be “like a 3D puzzle that changes shape and passes through different states to become the eye of an artificial being” in the words of Eyesberg. Venetian Snares aka Aaron Funk- just edited Traditiona Synthesizerl Music, an album released on his own label, Time Sig, and which has had a great reception from the most specialized press. An album with analog dyes, escaping from all trends and installed in the electronic underground music scene. The shows in Madrid and Barcelona will be the first time that Venetian Snares performs an analog live set. The opening act of Venetian Snares will be by the catalan artist Ralp. Ralp has created anexclusive hardware set focused on modular synthesizers with an open configuration where improvisation will play an important role-with pseudo-random sequences, fast rhythms and lots of distortion. The visual part of the show has been designed byDevice . The Barcelona´s studio has prepared a visual show that is automatically generated and audio-reactive. A minimalist and geometric universe where the contrast between black and white will be the protagonist.